The NFIB Small Business Legal Center and Arent Fox, PLLC, have teamed together to create a guide that helps small business prepare for OSHA inspections and avoid citations. 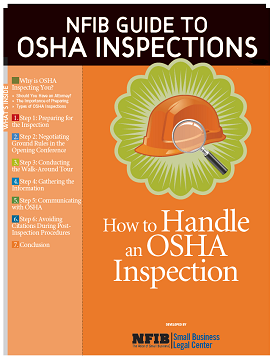 The handbook provides information about communicating and negotiating with OSHA and lists the type of information you will need for your inspection. The guide should not be considered a substitute for legal advice. Why is OSHA inspecting you? Should you have an attorney? Should an employer demand an inspection warrant? Should an employer designate a principal contact for an OSHA inspection?